We were immediately perked when we saw the long line spilling out of this newly opened Vietnamese eatery. Peering inside, we saw an interior with brightly coloured walls, even brighter lights, and cheery sketches on the wall. After a ten minute wait, we squeezed onto a four top that serviced five, and scanned the menu embedded in the table. Almost as a reflex, we ordered the raw beef noodle soup (pho, $32), then, just as naturally, an order of deep-fried spring rolls ($28). The rolls, unpleasantly blistered, arrived on two crisp lettuce leaves. We wrapped and dunked one in bottled sweet chilli sauce and loaded it in our mouth. We could feel the oil squeezing between the sheet of flour, diced mushrooms and carrots, spilling out the corner of our mouth. Not even the lettuce jacket could save us from greasy doom. Next up, the pho arrived. 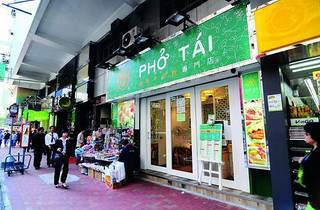 The broth was a dark shade of brown suggesting they use soy sauce, a big no-no in the land of pure phos, while the meat was specked with pepper, the result almost akin to having black pepper steak in soup. But the noodles, so soft to the bite and very fresh, balanced out the ingredient imperfections. We skipped the bean sprout though – it in front of us on a sharable tray, and we didn’t want to think about just how long it’d been there. Lastly, the lemongrass chicken wings ($26) arrived, piping hot out of the deep fryer. Double battered in a panko-like coating, they had thick, crispy exteriors and super juicy insides. Sure, they’ll probably cause us to breakout in spots, but we consider that a small price to pay for something this good. 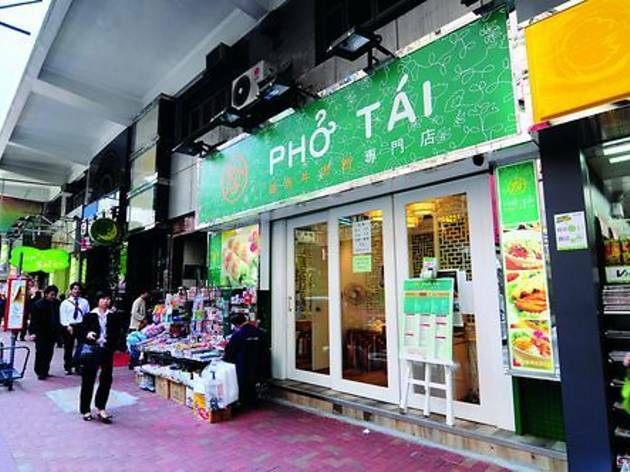 275 Lockhart Rd, Wan Chai, 2877 0323. Daily 11am-10.30pm. Meal for two: around $120.